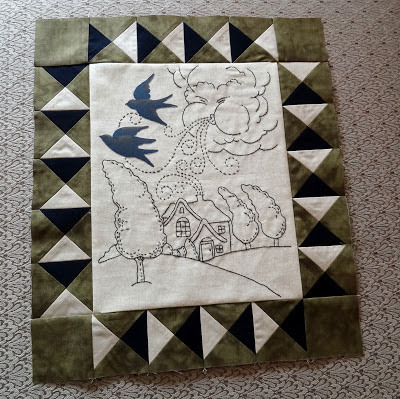 Squash House Quilts: Sewing, Shopping, Cooking! Thank goodness the strange widgets have gone away for now! Soon you'll be seeing a whole new look here at the Squash House. I can't wait! In the meantime I've been busy. Here is my completed March Winds BOM from Kathy Schmitz. I'll be sewing all the blocks into one quilt rather than making little quilts from each month. The birds are little applique pieces that come in the kit. At first glance I thought the colors weren't going to be to my liking, but now that it's done, I like it a lot! 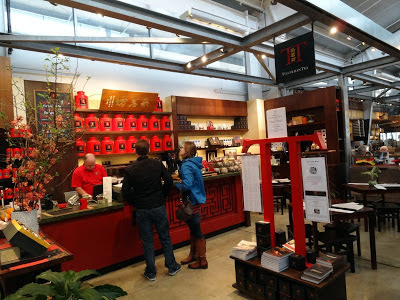 When we were in Napa we shopped in several places we had not been on prior trips. 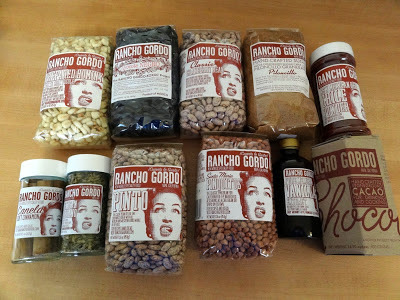 One of the most fun stops was Rancho Gordo in Napa. They grow heirloom beans which we were told don't have to be soaked as long as ones you buy in the supermarket. Here is my loot from the store. I adapted their recipe for chocolate chip cookies from their blog and will show you those next using some of these ingredients. Also, I made chili using the Pinquitos - it was wonderful! The day we arrived in Napa, Robert took us to the Oxbow market place for lunch. It reminded me of a smaller version of the Granville Island market in Vancouver, B.C. We had some wonderful, healthy tacos from one of the vendors here. Had we not been so full from lunch, we would have stopped at this vendor's eclair booth for dessert! 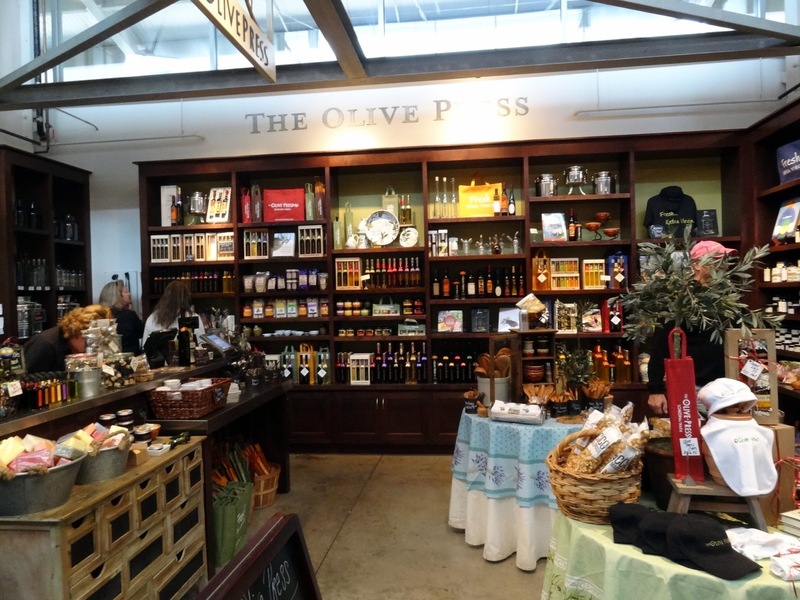 There are many stores in Napa that sell olive oil and various related products from olives grown around the valley. This is one of them. Check out this tea seller! 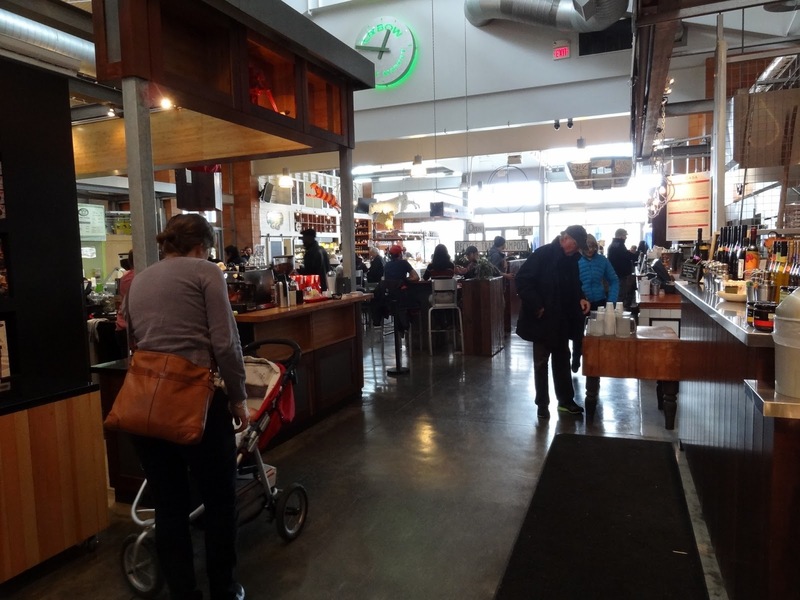 Here is a look down one end of the market. I'd like to spend more time here on our next visit. I've had the bug to try bread from sourdough starter for some time now. 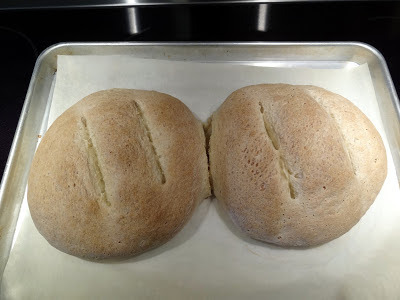 I think it comes from reading King Arthur Flour's blog! 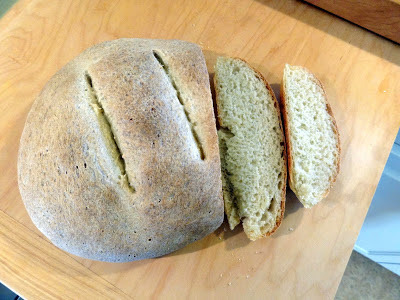 I ordered some sourdough starter, took a couple of days feeding it, and tried making their rustic sourdough bread yesterday. While it doesn't quite look like the picture in their blog post, it tastes pretty darned good! I was quite pleased how even the texture was, too! Mr. Squash and I indulged ourselves with a pot of butter and a couple of knives as soon as it was cool enough to slice! Stay tuned for my new look - there might even be a giveaway involved. I love King Arthur Flour and shop with them often. A good sourdough bread is hard to beat. Soooo good. Love your quilt block! Very nice! Your March Winds block is just gorgeous! Napa is such a wonderful place to visit - thanks for sharing those wonderful pictures! Great block! 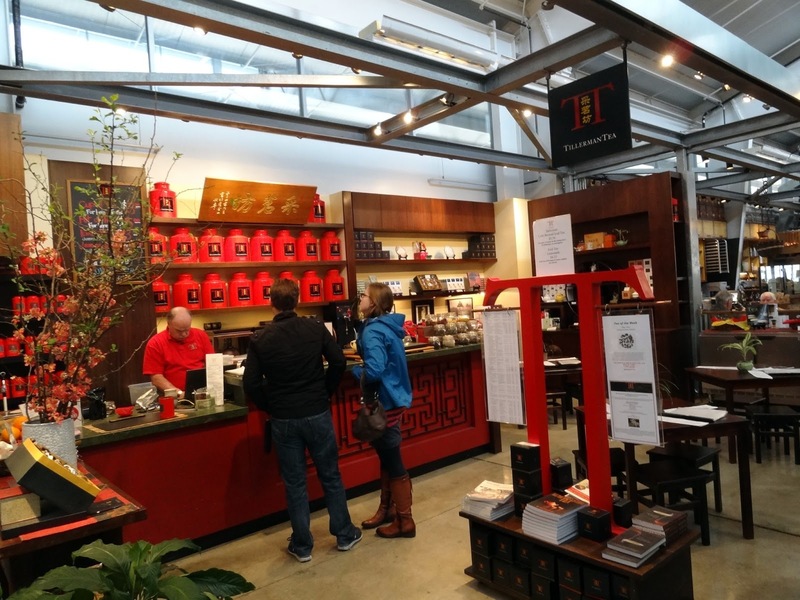 What a fun market to visit, it looks like you could spend a lot of time (and money!) there - FUN! Aren't the olive oils fabulous? They all taste so differently. I love the KA flours. Wish they had a shop close to us so I didn't have to pay the high shipping charges. Your wind block is gorgeous. Wonderful details in your block Candace. I'll bet your house smelled fabulous while the bread was baking! Looks delicious. A very pretty block and I can imagine an entire quilt of beauty. I would love that marketplace. I love sewing, cooking, and shopping for sewing and cooking things. Your bread is gorgeous and lots of butter is a must. Your bread look so yummy - I bet your house smelled so good. The market looks like so much fun. Can't wait to see your new blog look. I'm going to try to revamp my blog and make it a 3 column, so far I've just been reading about things to do to make it an easy transition, I haven't gotten brave enough to go for it yet. Good Luck! Thanks for the tour. The bread looks tasty. In the UK we aren't very adventurous with bread. I do like Irish soda bread though and knobbly bread with all sorts ofd seeds in. Hubby laughs. The block is immaculate- such lovely work. The colours work really well together. I cannot ever resist sourdough bread. Glad it worked out tasty! A new look! How exciting :-) All of those yummy treats look so good! I wish I could smell that bread through the iPad:-) Your March block is wonderful! 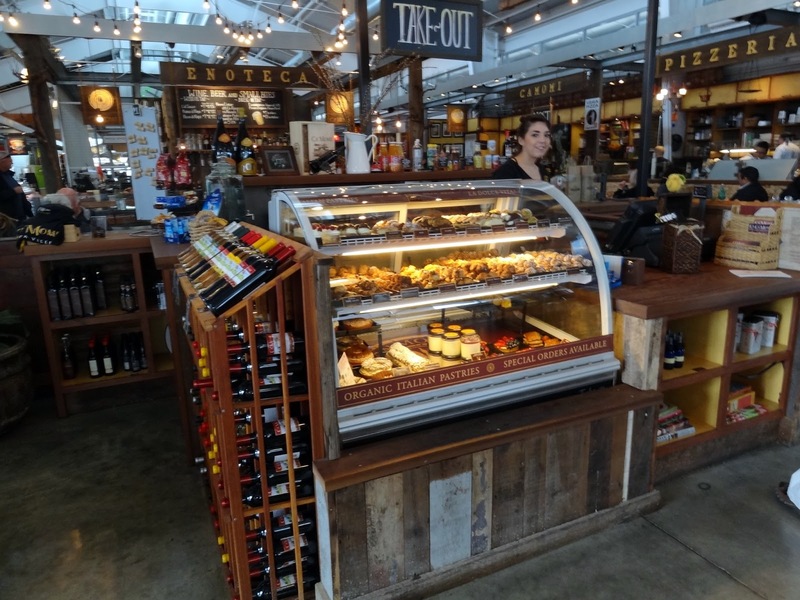 It's time we took another trip stateside because you can't but King Arthur flour in Canada. The last time we were down I stocked up but I just ran out. Drat! Its my favorite! Gorgeous photos of Napa. I'd love to visit someday. Wonderful pics of the shops...and of course I love your little quiltie! Your idea of putting them into one quilt is terrific. It will be so beautiful! You're right the photos do look like Granville..yum, love sourdough! The wind in your March blocks reminds me of a children's story where the wind and sun competed who will get the coat off from an old granny. First the wind was blowing as hard as he could and granny wrapped her coat tighter. Then the sun tried and smiled on the old granny warmly, and she took off her coat, sat down by the roadside and enjoyed. I just finished my frame for the little quilt and got the march winds traced. I put it all back in my special box. Looks like you will be trying some new recipes with all your goodies. Ooh I love that quilt block - can you tell me where you purchased it? Darling!!! 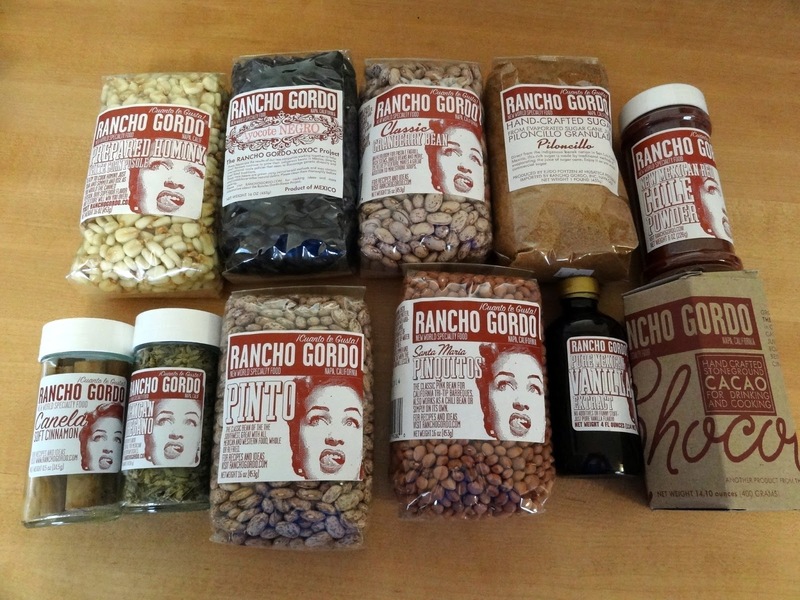 Some really yummy beans are pinquitos 'little pinks' Grown on the central coast of California, they are just yummy. Smaller than a pinto and pink, they hold up to cooking and don't turn mushy or fall apart. I grew up on these beans. Not easy to find in markets, but available on-line. Your bread looks delicious. 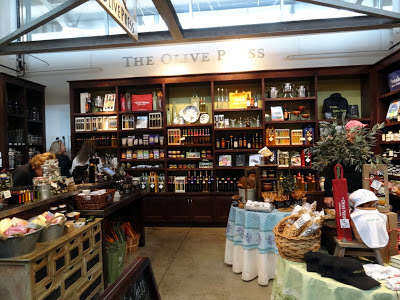 A couple of years ago, I went to an olive oil store in San Luis Obispo County. It was a real education. I never knew those stores existed before then. Had no idea there were so many flavors of olive oil. I love those Kathy Schmitz patterns! Who are you doing the BOM thru?